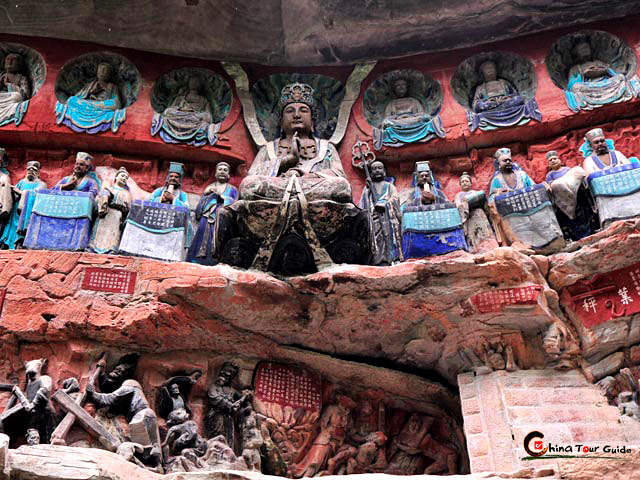 The Dazu Rock Carvings can be seen dotting the sides of the cliffs in Dazu County, best known for all of the rock carvings found there. 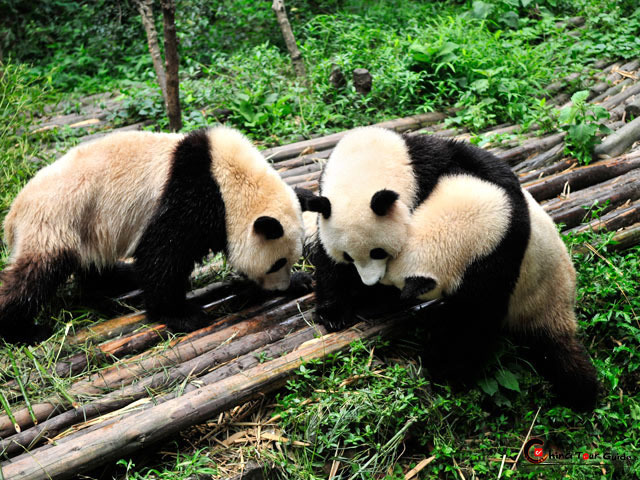 This spot is located in southeast Sichuan province 271 kilometers (168 miles) from Chengdu to the west and 167 kilometers (103 miles) from Chongqing to the east. 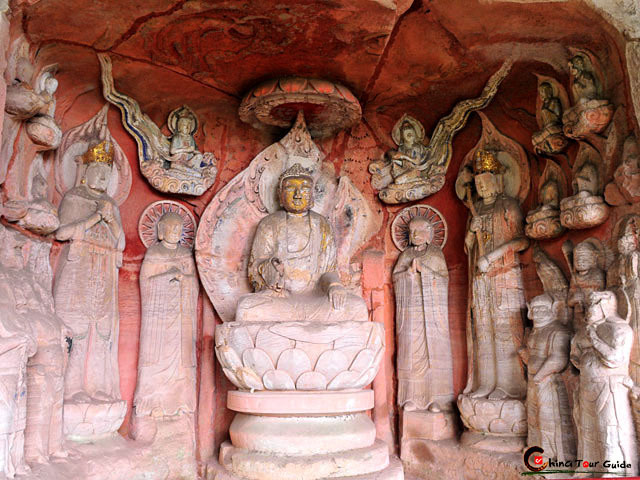 Exquisite Dazu Rock Carvings. Baodingshan section in Dazu Rock Carvings. 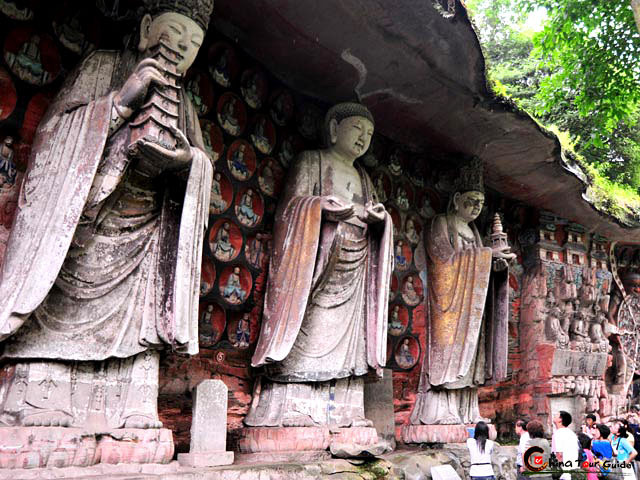 The Dazu Rock Carvings are made up of more than forty sites of stone carvings with over 50,000 statues of Buddha. 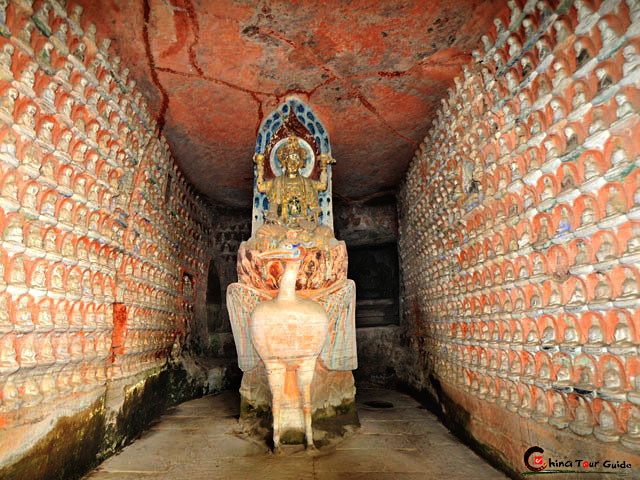 The Grottoes were completed during the Tang and Song Dynasties. 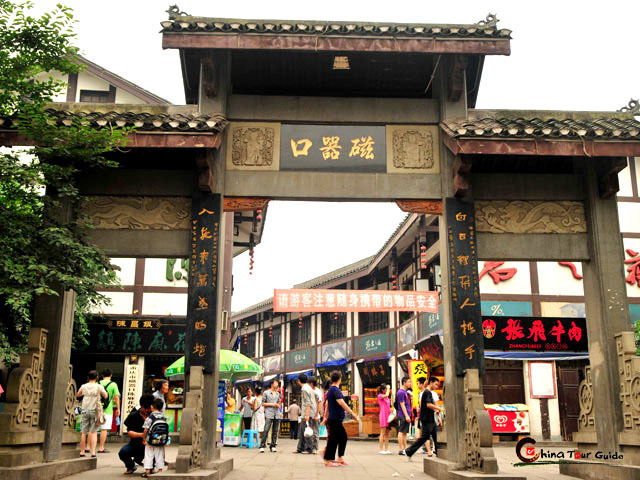 Of the forty sites, Beishan Hill and Baoding Hill are the largest in scale, richest in content and most refined in artistic skill. 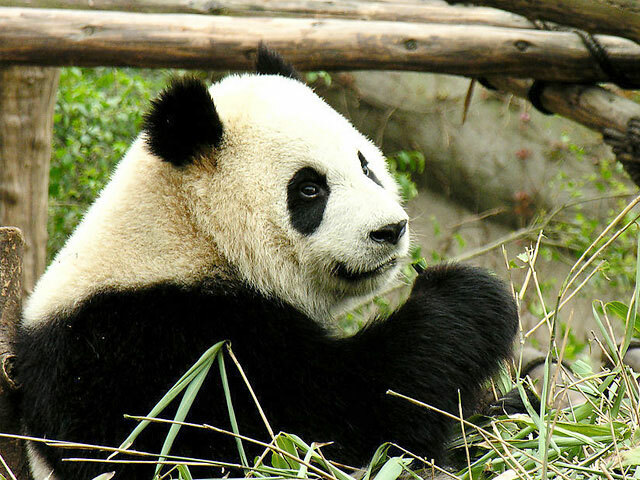 In 1999 they were added to the UNESCO list of World Heritage sites. Walking through the more than thirteen hundred year old outdoor art museum along winding paths, steps, and slight inclines makes for a relaxing and aesthetically pleasing journey. Differing degrees of beauty await visitors, from the simple to complex, plain to gaudy, and miniscule to giant. Each specific section's unique style is dependant on the exact time period it was carved. Some figures are lean and tall, others short and pudgy. Each has a story to tell that will interest everyone, regardless of your religious preference. Sleeping Sakyamuni Buddha carving in Dazu Rock Carvings. 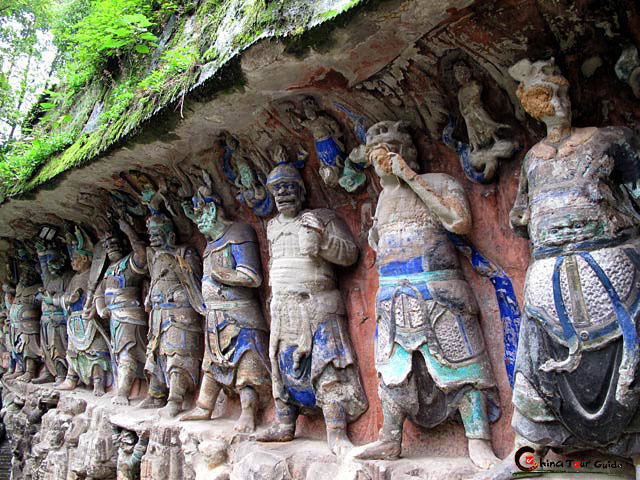 Many immortal beings stand in a line in Dazu Rock Carvings. One of the most beautiful carvings is the sleeping Buddha- Sakyamuni as he is called in China. It is 31 meters (101 feet) long, in a reclining position, and surrounded by much smaller statues of his mourning disciples and family members. A predominant figure of one of the Emperors solemnly faces the Buddha. The solemnity and serenity of the scene is truly remarkable. 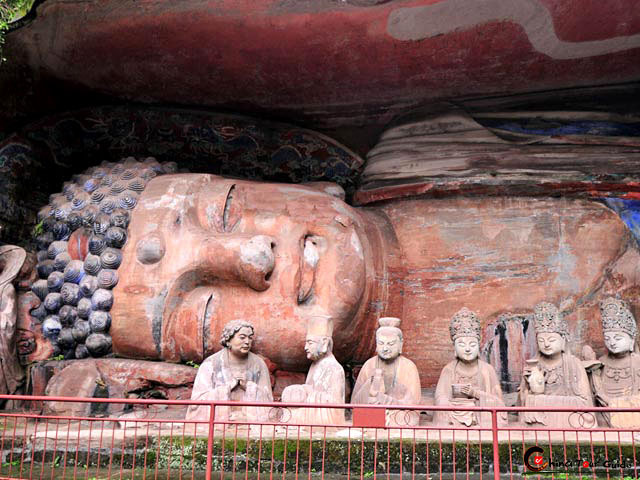 Buddha sculpture in Beishan section of Dazu Rock Carvings. 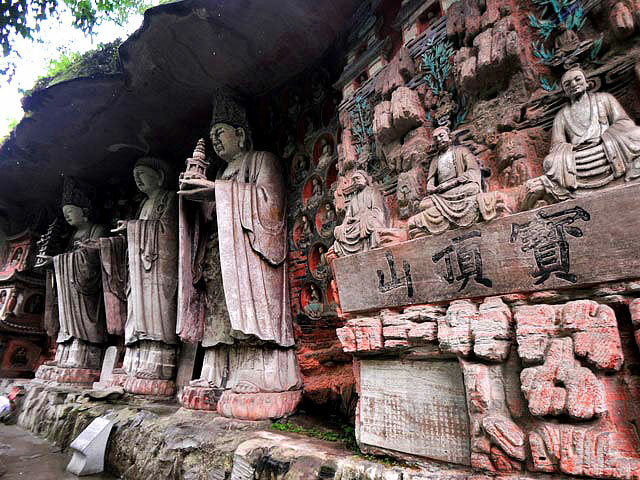 Carvings in Beishan section is older than Baodingshan section in age.